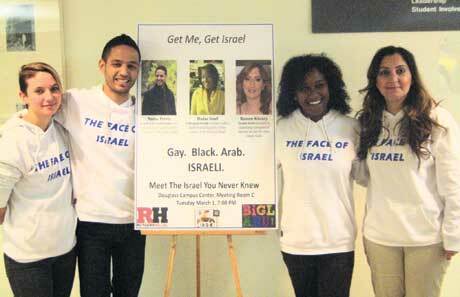 An event last week comparing Israel’s treatment of its Arab citizens to South Africa’s treatment of blacks under apartheid marked the latest in a series of anti-Israel programs at Rutgers University that some local Jewish leaders have characterized as an anti-Israel campaign targeting the school. The Rutgers event took place in concert with “Israel Apartheid Week” events at numerous university campuses. While some Jewish leaders are alarmed at this trend, others are of the opinion that, try as they might, anti-Israel groups are not making headway in their efforts to delegitimize Israel in the U.S. And Rutgers Hillel last week mounted its own campaign to highlight Israel’s diversity. The anti-Israel event, called “Israel, the Apartheid Analogy, and the Boycott, Divestment, and Sanctions (BDS) Movement,” held March 1 on Rutgers’ Douglass campus as part of “Palestine Awareness Week,” was sponsored by a group called BAKA: Students United for Middle Eastern Justice. BAKA has organized other events highly critical of Israel, including January’s “Never Again for Anyone” program featuring a Holocaust survivor critical of Israel. Area Jewish leaders expressed outrage at what they characterized as a false and offensive comparison between Israel and apartheid-era South Africa, and pledged to help pro-Israel students at Rutgers combat what they believe is a deliberate campaign of disinformation. Leonard Cole, an adjunct professor at Rutgers who teaches at the Newark campus in the division of global affairs, decried what he sees as an anti-Israel “drumbeat” on campus and called on the university to condemn it. In apartheid South Africa, according to Alan Elsner of the Israel Project, a non-profit organization that provides information about the Middle East, blacks had no right to form political parties, to vote, to live in certain areas, or to freely associate with whites, and South Africa’s government enforced this discrimination. In Israel, he pointed out, all citizens including Israeli Arabs have the right to vote, to speak, to assemble, to form political parties, to freely associate, and to live where they wish. The differences mean “there is not any valid comparison” between Israel’s government and South Africa’s during apartheid, said Elsner. “I’m not saying Israeli democracy is perfect, but show me another country in the Mideast where minorities, women, and gays have the same rights as they do in Israel,” said Elsner, who worked as a reporter in South Africa during apartheid. Jake Toporek, executive director of the New Jersey State Association of Jewish Federations, says his organization is working to “organize a movement to counter the BDS movement.” To that end, his and other area organizations including the Jewish Council for Public Affairs and Jewish Federations of North America are organizing a conference at Rutgers June 1. “The events on Rutgers campus are disturbing, but are a wake-up call to the rest of the Jewish community to remain vigilant and respond effectively, with a united front, and to do all it can to ensure that Israel remains a viable nation,” said Toporek. Ken Stern, director of the Division of Anti-Semitism and Extremism at the AJC, agrees. Stern noted that the effort to de-legitimize Israel on college campuses has gained traction in Canada, and said there is a real danger in larger global efforts to delegitimize the Jewish State. Meanwhile, Rutgers Hillel hosted its own series of events to coincide with “Palestine Awareness Week,” highlighting Israel’s diversity. A Feb. 28 event, “Israel at Heart,” featured Ethiopian Jewish Israelis and a Darfuri man who found refuge in Israel, all of whom made the case that “Israel is not an apartheid state,” according to Hillel Director Andrew Getraer. Last Tuesday’s event, called “Get Me, Get Israel,” featured an Israeli Arab woman who has organized Israeli Arabs to do a year of national service to Israel and two Israelis who are members of the country’s LGBT community. “They talked about the importance of seeing Israel not as a highly politicized country but as a diverse and accepting country,” said Raffi Mark, a sophomore at Rutgers majoring in American Studies who grew up in Wayne and who helped organize Hillel’s events. Heather Robinson can be reached at heather@jewishmediagroup.com.